Many of these evolved children and teens have been categorized as “problems” simply because they do not fit into the accepted third dimensional “belief box”. They are out of sync with many concepts and beliefs regarding body and mind simply because they do not resonate with that energy. The commonly accepted use of prescription drugs to “cure” them has caused many of them to lose sight of why they came and who they are. Drugs must be used with great discretion and with the awareness that they effect the energy of an individual. Many in today’s world are expressing anger, fear, frustration and other negative emotions because the false sense of security that comes with many universal beliefs is dissolving. Try not to become too involved in the nitty-gritty of world appearances. Be aware of them, do what you are guided to do, but continue to understand them for what they are, expressions of duality and separation. This does not make them any less painful for those experiencing as well as those observing, but when you hold fast to the higher truths, it helps dissolve the impersonal beliefs manifesting as these things. There is an element working very hard to prevent mankind from awakening because if the majority was to awaken they would lose the “power over” and control they feed on. These dear ones function from a consciousness of fear and separation, and so fear mongering is their favorite tool for controlling the masses and blocking Light. Stay alert to what comes into your mind knowing that no matter how obnoxious a thought, it is not yours until you accept it as personally yours. Everyone has experienced some negative thought and wondered; “Where did that come from?” Whether it is old cellular programming surfacing or something from the un-awakened consensus consciousness, it is never real, permanent, or yours unless you allow it to be. The only real qualities you have or can ever have, are God qualities. Yes, but, you say; “Look at all the people being harmed by others at this time.” Know that these types of situations are usually not random. More often than not, especially in these times, they involve souls who have agreed either as a group or individually to experience something for the purpose of; 1.-clearing some personal or group karma, or 2.- providing some unselfish service to mankind’s ascension process through an event or experience that will impact a lethargic world into awakening in some necessary way. My show this week is somewhat brief and touches on recent incidents and looks at them from a different perspective, instead of blaming the goverment, or shooters, or officers, or whomever, we fail to see who the real culprit is, who is the man behind the curtain. These incidents make us choose sides and yet we don't look at why this is really happening, do we? In some ways most of us are contributing to this as well, with our thoughts and what we support, whether it's violent movies, tv shows, video games, etc. Our anger, our hatred, the us versus them mentality. How can we each make a difference? Change our focus, what we focus on the most we get more of. No one has to join a group or march in the streets, all I'm saying is that if you want to make a difference it starts with your thoughts and words, and the one word that is the most powerful is...love. Next week I hope to speak with a local Bigfoot investigater. "Are people just making this stuff up? I have a hard time believing this stuff is real." That was my response when I first heard about the Manwolf. Then as time goes on you hear more and more and you start to think maybe people are seeing something. Fortunately I was able to connect with Linda Godfrey and my opinion changed. I've learned that some of the most open minded people seem to have moments of skepticism, it is not a bad thing but at the same time when you finally take the time to speak to someone who's researched a subject, listen with an open mind. Many of us just don't take the time to find out more, do we? Maybe 10 years ago I was returning back to my father in law's cabin with my father in law Bob and we were riding on a dirt road and I glanced down a two rut road that intersected our road and saw the biggest bird I've ever seen in my life, the wingspan of this bird covered the entire road. It was just getting dark and of course I didn't ask to stop the truck so I could see what the heck that bird was. A giant owl? An incredibly huge eagle? Around that time I had heard of the Thunderbirds, not the car, or the jets, but these enormously large birds that many had witnessed. Over time you forget about such things, even though I felt there probably was some truth in the many eye witness reports. A few weeks ago I saw an article talking about Pterodactyls being seen in North Carolina. Then I read some articles posted by Jonathan Whitcomb, a researcher from Utah. I contacted Jonathan and he was willing to come on my show and discuss the many sightings he's investigated and his own research. 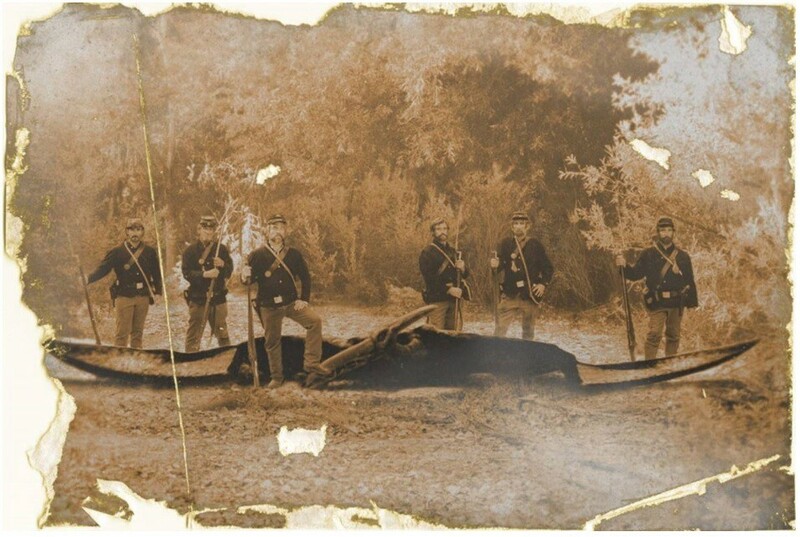 I've attached a picture at the top of this page that appears to show a group of Civil War era soldiers standing over a Ropen, or Pterodactyl. Is it real? I definitely think it could be. Are there prehistoric birds still flying around? I think they certainly could be. Does Nessie exist in Loch ness? Or Champ in Lake Champlain? I think they do. This week I am joined by Jonathan Whitcomb who has been researching Pterosaurs for almost 15 years. If you have an unsusual sighting please contact John at the website below. My buddy Art, from Florida, joins me this week. There have been reports on the networks, I really haven't followed any of this but Art has been following this topic. Art gave me a bunch of links to check out, they are listed below. Are we finally going to get the truth? Maybe a little, probably not all of it. Will we ever? I have no doubt it will come out, it has to as at some point. I believe those who have lied to us are being pressured by "other beings" to bring it forward. Art has been on before and we also talk about his connection to a man, Melvin Brown, who may have served at Roswell during the crash of 1947. Art wanted me to post the items listed below. Beverley (Brown) Bean told the British television audience during her interviews in the 90s many stories related to her dad, Roswell witness Melvin E. Brown. One of them was a tale that was told to one her uncles that the actual Roswell craft was buried in the sand on a 45 degree angle. She never gave the name to which uncle this was? Do the researchers know? Or was it even an uncle at all? 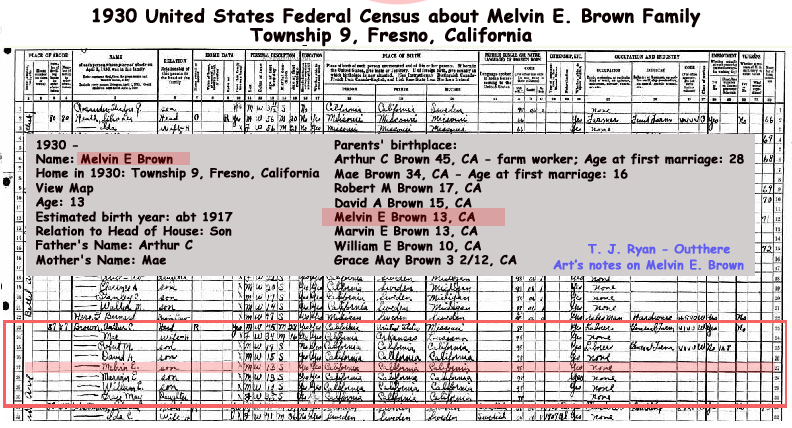 Shown below are some notes Art had on Melvin's family tree from the 1930 census indicating a large family from Fresno California with many uncles to choose from including a twin brother to Melvin named Marvin. Perhaps someone 'out there' had grandparents or great grandparents that are on this list? Did you hear any tales about Roswell while growing up? Also, credit to Byron Lacy for this weeks cool show intro.